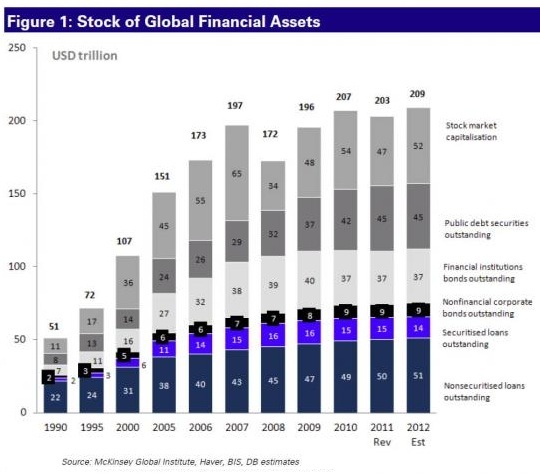 Inflating phantom assets to collateralize expanding debt is failing due to diminishing returns on stimulus, zero-interest rates, money-printing and monetization of Federal debt. That the policies of central states and banks have led to one disastrous asset bubble after another over the past 15 years is undeniable. This poses the question: is this serial bubble-blowing intentional, or are the bubbles merely unintended consequences of the neoliberal, neofeudal model of financialization that dominates global finance? 2. Inflate assets to create phantom collateral that can then support additional debt. Central states live off taxes skimmed from wages and profits. If wages are stagnant, the state needs profits and capital gains to rise to support higher tax revenues. In other words: inflate assets or die. The entire scheme of generating GDP with more and more debt now yields diminishing returns. Unfortunately for the central states and banks, though their unprecedented fiscal stimulus and money-printing has doubled the stock market off its 2009 lows, efforts to reflate housing have been tepid at best. This matters because only the top 10% own enough stocks and bonds to make a difference in household net worth, while two-thirds of households own a home. Inflating another asset bubble in stocks was nice for the financial Aristocracy and their technocrat-class, but it didn't do much to boost the net worth of the bottom 90% or enable more borrowing. Let's look at some charts that reflect the failure of massive money-printing and credit expansion to actually boost wages and household borrowing. 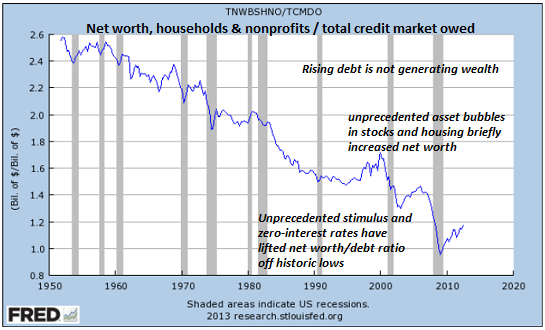 Meanwhile, the ratio of household net worth to total credit market debt owed has plummeted, meaning that debt is rising much faster than net worth. 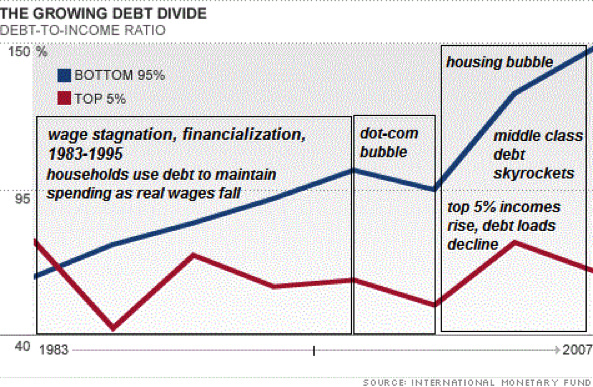 This is called debt saturation: adding more debt generates less and less expansion of wealth. 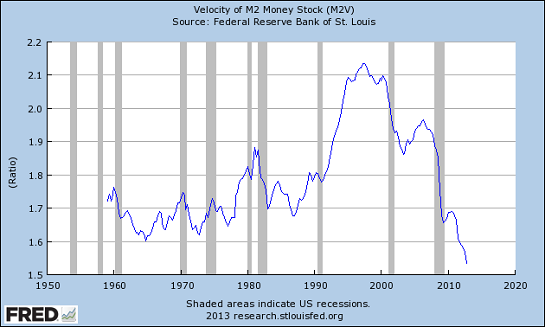 Cheap credit and financialization has boosted stock valuations far above the real economy, as reflected by the GDP. This chart shows just how disconnected stocks have become from the real economy. Despite these unprecedented measures to boost asset valuations and borrowing, household debt expansion remains below zero: debt is declining faster than it is being created, i.e. 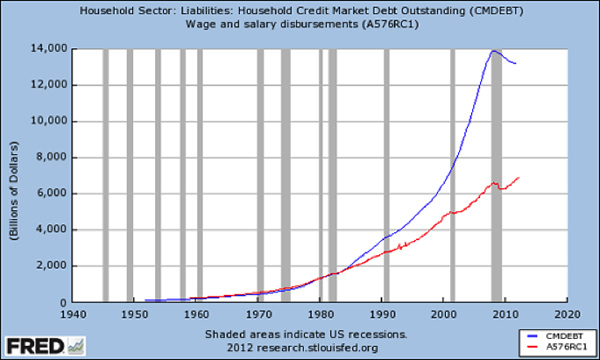 deleveraging. This has created structural deficits as tax revenues--despite the tailwind of highest-ever corporate profits and a stock market that more than doubled in four years-- are far below spending. Unfortunately for Central Planners, all their unprecedented efforts to reflate the housing bubble's phantom assets are not getting much traction. What did they expect in an economy with 19 million vacant dwellings and declining real income for 90% of households? Bottom line: inflating phantom assets to collateralize expanding debt is failing due to diminishing returns on stimulus, zero-interest rates, money-printing and monetization of Federal debt. 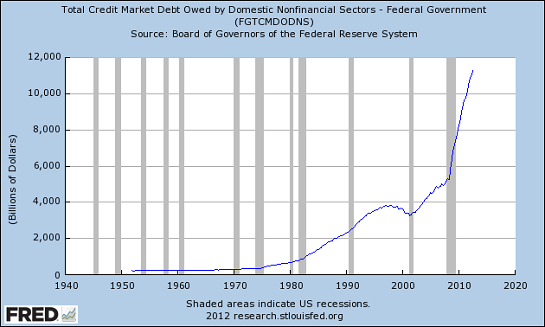 Once debt stops expanding, the house of cards that is dependent on ever-expanding debt collapses. NOTE TO TRADERS/INVESTORS: Friend of oftwominds.com Tony Pallotta has expanded his trading service (MacroStory) to ReThink Market Advisors. If you actively manage your trading or investment portfolio, check out his new range of services. Thank you, Christopher H. ($100), for your outrageously generous contribution to this site -- I am greatly honored by your steadfast support and readership. Thank you, Roger H. ($25), for your formidably generous contribution to this site --I am greatly honored by your steadfast support and readership. 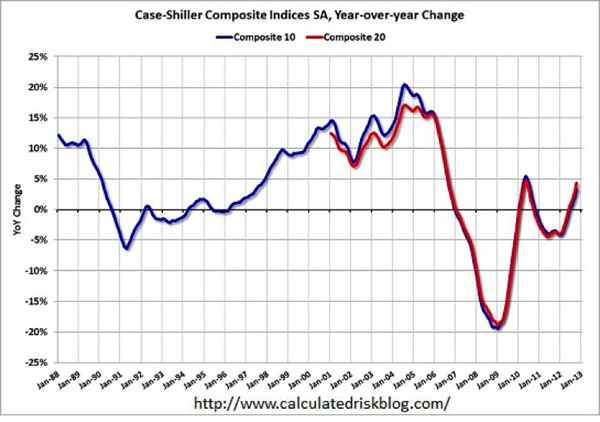 What Could Go Wrong with the Housing Recovery in 2013? Plenty. Federal subsidies and Federal Reserve policies enabled a vast expansion of debt that masked the stagnation of income. Now that the housing bubble has burst, this substitution of housing-equity debt for income has ground to a halt. 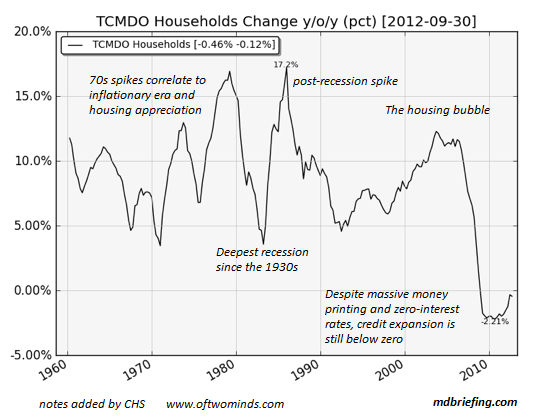 What could go wrong with the housing recovery in 2013? To answer this question, we need to understand that housing is the key component in household wealth. As a result, Central Planning policies are aimed at creating a resurgent "wealth effect": When people perceive their wealth as rising, they tend to borrow and spend more freely. This is a major goal of U.S. Central Planning. Another key goal of Central Planning is to strengthen the balance sheets of banks and households. The broadest way to accomplish this is to boost the value of housing. This then adds collateral to banks holding mortgages and increases the equity of homeowners. Some analysts have noted that housing construction and renovation has declined to a modest percentage of the gross domestic product (GDP). This perspective understates the importance of the family house as the largest asset for most households and housing’s critical role as collateral in the banking system. Since housing is the largest component of most households’ net worth, it is also the primary basis of their assessment of rising (or falling) wealth (i.e., the "wealth effect.") No wonder Central Planners are so anxious to reflate housing prices. 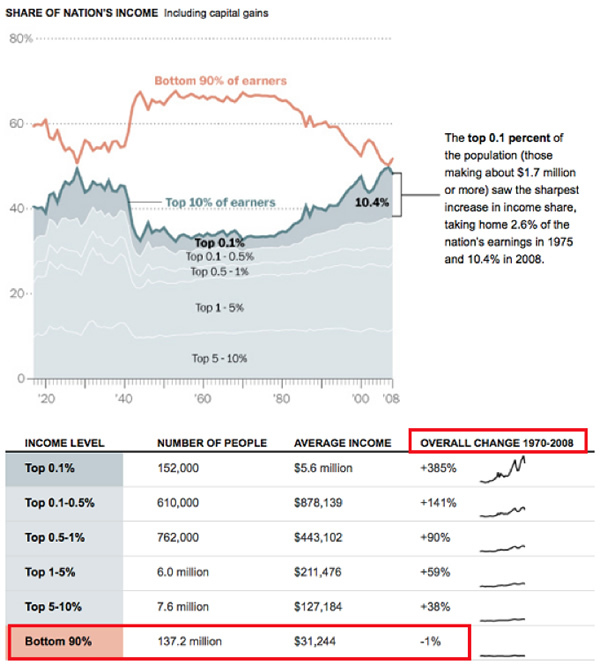 With real incomes stagnant and stock ownership concentrated in the top 10%, there is no other lever for a broad-based wealth effect other than housing. Given the preponderance of housing in bank assets, household wealth, and the perception of wealth, the key policies of Central Planning largely revolve around housing: keeping interest rates (and thus mortgage rates) low, flooding the banking sector with liquidity to ease lending, guaranteeing low-down-payment mortgages via FHA, and numerous other subsidies of homeownership. 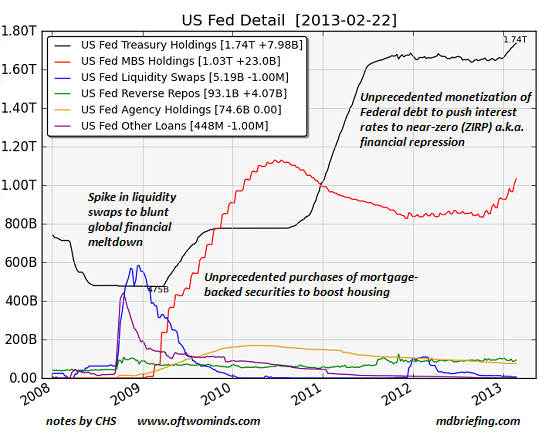 1) The purchase of $1.9 trillion of mortgage-backed securities (MBS) by the Federal Reserve. The Fed purchased $1.1 trillion in mortgages in 2009-10 and it recently launched an open-ended program of buying $40+ billion in mortgages every month. Recent analysis by Ramsey Su found that Fed purchases have substantially exceeded the announced target sums; the Fed is on track to buy another $800 billion within the next year or so. This extraordinary program is, in effect, buying 100% of all newly-issued mortgages and a majority of refinancing mortgages. Never before has the nation’s central bank directly bought 15%+ of all outstanding mortgages this raises the question: Why has the Fed intervened so aggressively in the mortgage market? There is no other plausible reason other than to take impaired mortgages off the books of insolvent lenders, freeing them to repair their balance sheets. Regardless of the policy’s goal, the Fed now essentially controls a tremendous percentage of the mortgage market. 2) After the insolvency of the two agencies that backed many of the mortgages originated in the bubble years (Fannie Mae and Freddie Mac), the minor-league backer of mortgages (FHA) suddenly expanded to fill the void left by Fannie and Freddie. Many of these mortgages require only 3% down in cash, just the sort of risky “no skin in the game” mortgages that melted down in 2008. Given this mass issuance of low-collateral loans to marginal buyers, it is no surprise that the FHA will soon require a taxpayer bailout to cover its crushing losses from rising defaults. This raises two questions: Where would the mortgage and housing markets be if Central Planning hadn’t effectively socialized the entire mortgage market? 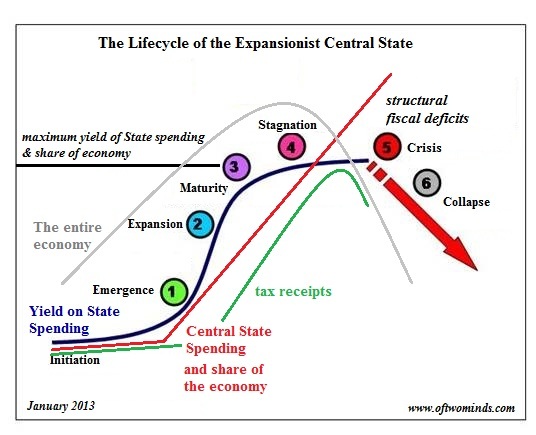 What will happen to the market when Central Planning support is reduced? 3) Official measures of inflation are viewed by many with a healthy skepticism, but even this likely-understated rate has recently exceeded 2.5% annually. In this context, it is unprecedented that one-year Treasury bonds have near-zero yields, effectively costing owners a 2%+ annual fee for the privilege of owning short-term Treasuries. Even more astonishing, rates for conventional 15-year mortgages are comparable to official inflation (the Consumer Price Index, or "CPI"). Lenders are earning near-zero premiums on these mortgages. How sustainable is this imbalance of risk and return? This formidable Central Planning support of housing has placed a bid (i.e., a floor) under housing, resulting in two bounces since the housing bubble popped in 2007-9. The first heavily subsidized rise faltered. Will the latest pop also reverse? 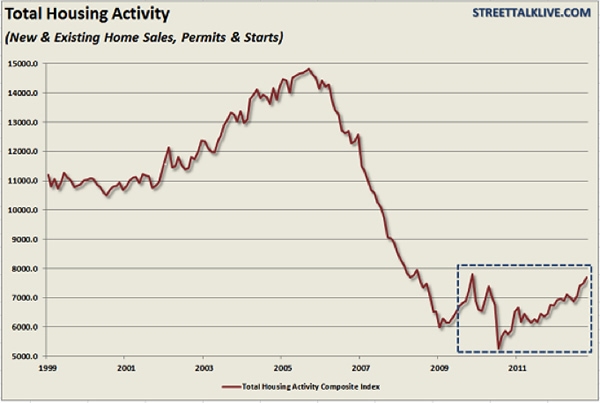 Or is the much-desired “housing bottom” in, from which prices will continue their ascent? In the macro context, what housing bulls are counting on is the emergence of an “organic,” self-sustaining recovery in housing, based not on Central Planning subsidies but on private demand and non-agency mortgages. Housing skeptics are looking for signs of what will happen when unprecedented support and intervention in the mortgage and housing markets is reduced or withdrawn. About two-thirds of all homeowners have mortgages. 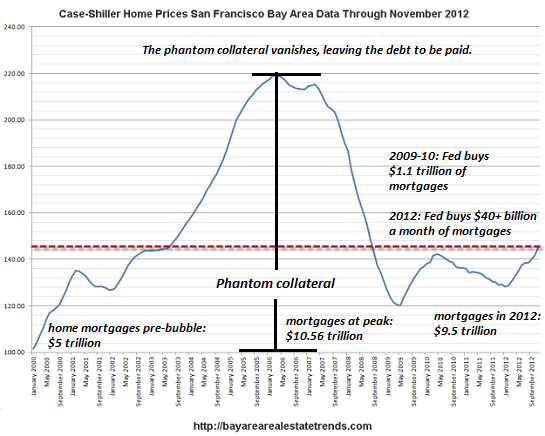 As I noted in The Rise and Fall of Phantom Housing Collateral, mortgage debt doubled from about $5 trillion in 1997, before the housing bubble, to $10.5 trillion in 2007, at the top of the bubble. This reliance on debt informs the Central Planning policies of lowering interest rates and guaranteeing mortgages via Federal agencies such as the FHA. The only way debt can increase is if incomes rise or the costs and qualification standards of borrowing decline. Since income for 90% of households has been stagnant for decades, the only way debt can expand is by lowering interest rates and reducing the risk exposure of debt issuers via Federal guarantees. These policies have been pushed to the maximum. As a result, the policy tool bag to further boost housing is now empty. Now there is only one direction left for interest rates (up) and for housing subsidies and guarantees (down). Housing equity as a percentage of total net worth declines when the stock market rises strongly while housing gains at a much lower rate (for example, during the Bull markets of 1952-1968 and 1982-2000) and rises as stock equity falls (for example, 1969-1981) while housing rose. In the 2001-2008 era, both equities and housing both climbed sharply, but since housing is the larger share of most households’ net assets, housing’s rise overshadowed the expansion of stock net worth, causing home equity to rise as a percentage of total net worth. In other words, Federal subsidies and Federal Reserve policies enabled a vast expansion of debt that masked the stagnation of income. 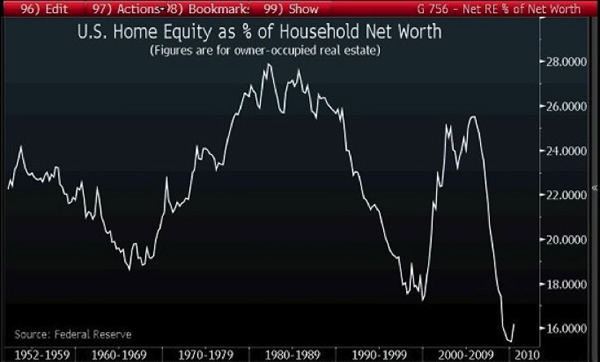 Now that the housing bubble has burst, this substitution of housing-equity debt for income has ground to a halt. This created a reverse wealth effect: The 70% between the bottom 20% and the top 10% have seen their net worth plummet while their debt load remains stubbornly elevated. While charts like this lump all household debt and income together, this masks the reality that there is a clear divide between the top 10% and the bottom 90% in terms of income and debt. The debt load of the top 10% is considerably lighter than that of the bottom 90%, while income and wealth gains have flowed almost exclusively to the top 20%. Unsustainable Pricing Will Introduce the "Poverty Effect"
If we put all this together, we get a picture of a middle class squeezed by historically high debt loads, stagnant incomes, and a net worth largely dependent on housing. In response, Central Planners have pulled out all the stops to reflate housing as the only available means to spark a broad-based “wealth effect” that would support higher spending and an expansion of household debt. This returns us to the key question: Are all these Central Planning interventions sustainable, or might they falter in 2013? Once markets become dependent on intervention and support to price risk and assets, they are intrinsically vulnerable to any reduction in that support. Should these supports diminish or lose their effectiveness, it will be sink-or-swim for housing. Either organic demand rises without subsidies and lenders originate mortgages without agency guarantees, or the market could resume the fall in valuations Central Planning halted in 2009. In Part II: The Forces That Will Reverse Housing's Recent Gains, we examine the statistical, historical, and demographic trends that suggest the market recovery is now dangerously vulnerable to a relapse, regardless of Central Planning intervention. Click here to read Part II of this report (free executive summary; enrollment required for full access). This essay was first published on peakprosperity.com where I am a contributing writer. For another excellent analysis that dismantles the housing 'recovery', please read It's Always the Best Time to Buy by Jim Quinn. Thank you, Heriberto V. ($5/month), for your splendidly generous subscription to this site -- I am greatly honored by your support and readership. Thank you, Kenji K. ($5/month), for your formidably generous subscription to this site --I am greatly honored by your support and readership. There is no one solution to something as complex and costly as healthcare; the solution is to let 100 solutions blossom and compete openly for citizens' money and trust. Nobody likes any of the practical solutions because everyone wants unlimited care and unlimited choice. Expectations in a system where the government can just borrow another $1+ trillion to pay the bills are high, and the feedback from reality, i.e. price, has been eliminated in the cartel/fiefdom system that is sickcare. Everyone talks about "reform," but real reform is impossible in a bought-and-paid-for "democracy" like ours: Why Reform Won't Work (February 7, 2013). Even more profoundly, the Central State and ObamaCare are the wrong unit sizeto provide healthcare that is transparently priced, accountable to the consumer, adaptable and decentralized. We are so brainwashed by centralized models of authority ruled by the State that few can even imagine a system where the solution is not one centralized monstrosity ruled by a political/financial Aristocracy but a competing profusion of opt-in, transparent solutions. Rather than have a single system, we need dozens of choices. 2. there is a cash co-pay for every service, medication, test. etc. Nothing is free, because nothing is free. What is presented as free is abused and squandered. If a national superstore chain opens clinics that accept only cash, great. If employers want to offer healthcare insurance, fine; if they don't, that's also fine. If some insurance companies want to offer medical insurance, fine. The only requirement is that the fees and coverage must be transparent enough and clear enough to fit on one piece of paper. Every service offered by either the State or a private insurer or provider must be transparently priced on the web. If the Central State does offer healthcare of any sort, it cannot be open-ended, because the funding is not open-ended. It must be strictly limited, either in what is offered or in the sum of money that can be spent on any citizen/patient. You see the guiding principle here: patients are given the costs, the limits and the choices. There are often hard choices to be made, and rather than empower a State-run cartel/fiefdom system to make those choices, let each citizen make their own choices. If a person wants to spend more than the sum allotted by the State or insurance, then they are free to spend their own money or appeal to charity. There is no one solution to something as complex and costly as healthcare; the solution is to let 100 solutions blossom and compete openly for citizens' money and trust. If there is a political will for some sort of State-operated healthcare, then it must contain limits on the sum that will be spent per person and the care that is offered, and it must enable transparent pricing, wide-open competition and patient choice. Perhaps cities want to offer some sort of public care; it's the choice of the city's voters and taxpayers. Maybe local private clinics want to offer their own limited form of insurance; they should be free to do so. Centralized, top-down systems are quickly shorn of innovation and cost control as the political and financial Aristocracy soon capture the regulatory and governance machinery for their own benefit. As I noted in The Pareto Economy (February 18, 2013), 80% of the benefits could be reaped for 20% of the money squandered on our corrupt, fraudulent, ossified centralized systems. When the present path cannot possibly lead to success, regardless of the labor and treasure poured into the effort, then risking the unknown by trying something different is the only way forward. America is just going through the motions because we have no other choice--or so we believe. Thank you, David P. ($25), for yet another wondrously generous contribution to this site -- I am greatly honored by your steadfast support and readership. Thank you, John F. ($5/month), for your splendidly generous re-subscription to this site --I am greatly honored by your steadfast support and readership. What If ObamaCare, Too Big To Fail Banks and the State Are All the Wrong Sized Unit? The State has monopolized all authority, giving it essentially unlimited power to make things worse. What if it's not just nation-states that are the wrong sort of unit, but also "too big to fail" banks, ObamaCare, the global corporation and every other large-scale, centralized organization? Correspondent Mark G. stated the resulting hypothesis very succinctly: "We are exiting the era when large economic entities were the dominant form of human social organization." If the Central State and the global corporation are losing integrity and control, it is not due to bad policy or mismanagement; more profoundly, they are the wrong unit size to address the emerging era's problems. The State is too large to address most problems (actively making problems worse via Central Planning), and too small to address global challenges. The global corporation is too large to address the 90% of human life that isn't terribly profitable, and too small to resolve the implosion of the debt-dependent Status Quo. The State has monopolized all authority, giving it essentially unlimited power to make things worse. Since the Status Quo in both developed and developing economies is at heart a crony-capitalist partnership of cartels and the State, the transnational corporation's authority ultimately flows not from the market but from the State that enables and protects its markets and margins. In the larger scheme of things, what has happened is highly centralized concentrations of power, capital and authority have been expanding their control and reach for decades. Their growing unit size was once advantageous in terms of increasing efficiency, but now they have become the wrong sort of unit to address and solve the problems they have created or enabled. Their utility has stagnated and is now in decline, following a classic S-Curve of rapid growth/high returns, stagnation/diminishing returns and decline/collapse. Their very size and dominance inhibits solutions. the problem this causes is more akin to the problems of ecological 'monoculture'. That is: Monocultures are massively prone to catastrophic failures when conditions do not suit and thus require enormous amounts of inputs (including managerial expertise) than a diverse ecosystem/economy where if conditions (or management) cause some varieties to fail, there are others that will offset the losses. My point here is the size of the unit matters only in that you can fit more small-sized units inside a given system, thereby giving it greater diversity and thus greater adaptability across a wider range of circumstances. I guess it's like in a rainforest where when a huge and old tree collects all the sunlight up high ... then it comes down in a storm ... all the dormant seeds in the undergrowth now get a share of the light, germinate, grow ... then compete with each other for a share of the light until a single, large, old tree 'wins' and once again fills the entire space, stops the light reaching the forest floor, crushing all opposition. Well ... except the epiphytes that figure out how to attach themselves to the top of the tree and thus get a little light to live on. In 2008 the economic big trees were in fact blown down in a storm. But some meddling fools stood them back up and tied them in place and put them on life support instead of letting them rot away on the forest floor and allowing the flush of new growth take hold. Meddlers take note: you can't fight the change that nature intends on an indefinite timeframe. The “wrong unit size” can be carried further to the topic of "risk and risk management", with its goal of eliminating any and all risk (the Status Quo infrastructures being the massive derivatives and their insurance instruments, quantity unknown, but of suspected very poor quality). These are concepts inherently impossible to apply with adequate results as the world is structured. The Status Quo risk management system is known to be utterly flawed and vastly leveraged/overextended as the Western monetary, fiscal and welfare spheres currently demonstrate, and the wrong size of management unit is certainly applicable. Large or small in intent or scope of action, the world has failed, as it always has, at risk management. Risk management and ecology are two sides of the same coin. A diversified ecology of many units and many unit types is intrinsically more resilient than centralized-authority monocultures. Since concentrations of centralized capital, authority and power does not relinquish control easily, if ever, the Status Quo will have to decay and implode before authority can be pushed down to more responsive, appropriate levels. The solution is to push authority down to decentralized units of local, opt-in, collective-intelligence organizations that are much more diversified and better sized to respond to both local conditions and feedback and global networks of similar-sized units. This essay was drawn from Musings Report 7 (2-16-13), The Wrong Unit Size. The Musings Reports are sent to subscribers and major contributors. More information can be found in the right sidebar. Thank you, Marsha F. ($25), for yet another monumentally generous contribution to this site -- I am greatly honored by your steadfast support and readership. Thank you, John R. ($5/month), for your stupendously generous re-subscription to this site --I am greatly honored by your steadfast support and readership. Under his genial questioning, Alexia revealed her hope to acquire a huge horde of classic movie posters from a friend. The collector in Ross completely grasped her enthusiasm, and his sympathetic interest further endeared her to him. Under her direct inquiry he confessed to collecting a few odds and ends himself—melamine serving platters from the 60s, the ones with space-age designs, a few rare journals from the 1960s—and a modest new interest in film posters. Each was circumspect about their personal business and wary of providing details which might raise the eyebrows of their bedmate or trigger questions which might besmirch their tender state of communion. For each sensed their own eccentricities rendered them vulnerable to potentially fatal first judgments; and rather than risk upsetting the fragile knitting between them, each chose a guarded discretion. If ignorance wasn't precisely bliss, it certainly resided in the same neighborhood, and each concluded that their collecting business was best alluded to as a light-hearted hobby rather than a peculiarly consuming interest. As the pixies garrisoned in the flat did not understand human speech—it sounded rather like birds chirping to them, though much less pleasant—their sense of when conversations might fray or even pull apart the romance being nurtured was not infallible. As Ross veered dangerously close to mentioning his kitchen appliances collection and the Las Vegas show—a topic which would have most certainly inflamed Alexia's curiosity, if not outright alarm—Fate in the form of Hanover the cat meowing for his breakfast intervened. Putting on his embroidered Chinese smoking jacket, Ross went to the kitchen to feed Hanover while Alexia slipped on a fluffy pink robe and went to the computer in the living room to check her eBay account for activity. Had Ross joined her, he would have spotted her account name on the screen; but with hunger intruding on his happy state, he set about making a sustaining breakfast for his new love. 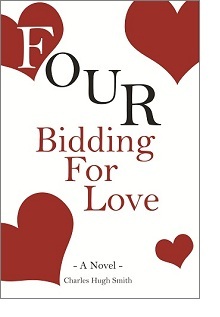 With past romantic failures vividly in mind, each was wary of overburdening the gauzy intimacy that love's invisible loom was weaving between them. As a result, neither suggested a day together; on the contrary, each offered the other respite: Alexia had a shift to work at a nearby boutique, and Ross voiced his need to begin searching for permanent living quarters. Alexia kindly provided him with an old but serviceable laptop computer, and after a hug enhanced by the pixie garrison's liberal dose of romantic gold-dust, the couple parted. As Alexia emerged into the bright daylight, there was no chance she would see either Robin or Kylie, for the pair had left for a Saturday spent enjoying San Francisco. And while she walked to the boutique, mulling her changing fortunes, Ross set up the old laptop and checked his eBay account and email. Though he knew it was too soon to expect the Las Vegas show authorities to approve his application, he'd hoped for a confirming email anyway. But this minor disappointment could not dent the affirmative future he now saw ahead, and his search for another room in Berkeley was half-hearted indeed. For the space he hoped to occupy was but a few feet away: Alexia's bedroom. Even though his male curiosity about what she looked like sans clothing had been satisfied, he found himself thinking of little else but her. In true contrarian fashion, her protective hesitancy only piqued his desire to win her, not just twice, but completely, and for good. For Ross wallowed miserably in relative comfort, and rose only to the longest-shot challenges; Alexia, being shapely and youthful and smart and eccentric, posed a nearly airless summit to a slightly plump, not very handsome, easily annoyed eccentric who also happened to be nearly penniless. As a result of these long odds, Ross set his mind on making another praise-worthy dinner that night, and laundering and pressing his remaining clothing, for someone as fastidious as A.R. would not find slovenliness charming. And I need to lose some of my belly flab pronto, Ross resolved; a good long walk every afternoon down to the Marina will be a start. Alexia's diffidence was not her only irresistible feature, for she'd revealed a tender vulnerability beneath her hard-shelled brusqueness. Though anyone could see her sexiness, it was her well-masked vulnerabilities which fired Ross's fantasies: here was a woman who'd been wounded. Wary of love and men, it was nearly impossible to win her trust and affection—and so that became his Everest, the summit he would give his all to reach. The traffic between Alexia's mind and heart was so brisk she barely noticed anyone or anything on Green Street. It was foolish to feel humiliated, she told herself; she hadn't inquired if Robin was attached before offering herself, and she could hardly blame him for not volunteering he had another lover. Nonetheless, their sofa time had been so mutually satisfactory that it was natural for the candle of romantic hope to light, and equally natural for the humiliation of being enjoyed and then tossed aside so cavalierly to sting like gravel in the bleeding knee of a fallen 12-year old girl. For listening to the activity in Robin's studio last night had made her feel just like a girl who thrilled to the handsome boy's kiss and then spied him the next day kissing a pretty girl she could not hope to best. Her practical mind was willing to chalk up last night to the natural desire of someone sandwiched, as it were, between two couples to show the world she did not have to sleep alone. Like the young lady at the party who watches her friends all drift off with boyfriends and finds the last remaining boy—a rather plain and boring specimen of manhood—a worthy enough vehicle to prove her own desirability, Alexia was ready to confess to that quiet desperation and redemption with R.T. But this morning had thrown her practical side into confusion, for though she did not find Ross either ugly or handsome, he was attentive and adoring, and her heart was sending her rational mind urgent messages that only a woman marooned in adolescent superficiality would place mere good looks and wealth—both of which could quickly depreciate to zero—above the true wealth of a kind and loyal male heart. ObamaCare will act as a neutron bomb on employment in the U.S. for two basic reasons. Sickcare is unsustainable for a number of interlocking reasons: defensive medicine in response to a broken malpractice system; opaque pricing; quasi-monopolies/cartels; systemic disconnect of health from food, diet and fitness; fraud and paperwork consume at least 40% of all sickcare funds; fee-for-service in a cartel system; employers being responsible for healthcare, and a fundamental absence of competition and transparency. 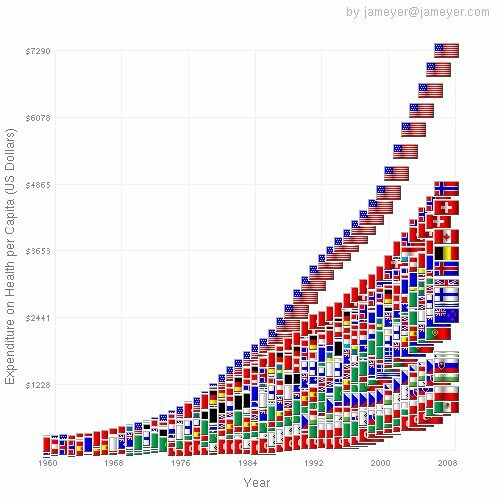 Please glance at these charts to see how the U.S. healthcare costs are double those of competing nations on a per capita basis. 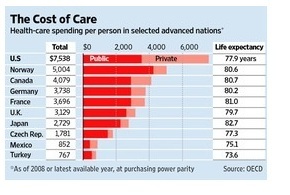 Japan provides care for a mere 36% per person of what the U.S. spends--yet millions of Americans remain uninsured or underinsured. If you set out to design a corrupt, inefficient, wasteful, unfair, deranged and unreformable system, you would arrive at U.S. healthcare. 86% of Workers Are Obese or Have Other Health Issue Just 1 in 7 U.S. workers is of normal weight without a chronic health problem. The Patient Protection and Affordable Care Act (PPACA), i.e. ObamaCare, is a neutron bomb for employment. A neutron bomb is an enhanced-radiation thermonuclear weapon that famously leaves buildings, autos, etc. intact but kills all the people, even those inside buildings, vehicles, etc. 1. It is immensely complex, and already-marginalized small business owners will shed employees or simply close rather than have to figure out what all those thousands of pages of regulations and statutes mean to the survival of their business. 2. ObamaCare's primary mechanisms of lowering costs, insurance exchanges and technocratic selection of "best care practices," do nothing to change the systemic flaws of sickcare. Many other commentators have already outlined how ObamaCare is driving employers to replace fulltime workers with part-time workers to avoid having to pay outrageously expensive monthly healthcare insurance premiums. In this sense, the ObamaCare neutron bomb is already decimating fulltime employment. I see this response as a Corporate-America strategy. Corporate America has the human resources infrastructure and financial heft to figure out compliance and exploit loopholes in the insanely complex law. Small business has neither the infrastructure nor the financial resources. Small business owners will rely on the same cartels that are currently providing insurance for guidance, and of course the ObamaCare offerings will suit the financial needs of sickcare cartels. Once small business owners see the costs of their options, some may opt to pay the penalties and others may follow the corporate strategy of turning each fulltime job into two part-time jobs to avoid paying for coverage or penalties, but many will choose instead to call it quits: either downsize to a one-person/one-household business with no employees at all, or sell/close the enterprise and escape the burdens. 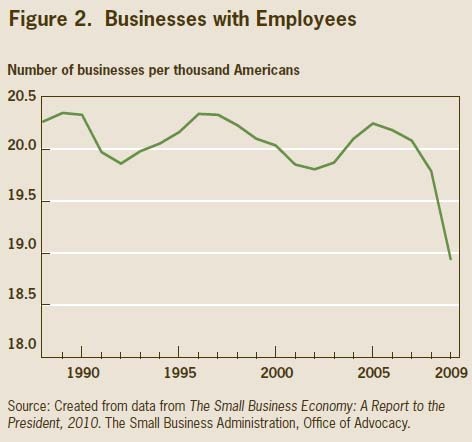 What the lobbyists and attorneys who wrote the Obamacare monstrosity do not understand (because they have no exposure to or experience in the real economy) is the fragility of most small businesses: costs keep rising but revenues are stagnant. The mental and financial stresses keep rising, and ObamaCare does nothing to mitigate either source of stress. The inside-the-Beltway types who crafted this mess have no idea of the pressures facing legitimate (non-black-market) business in America, corporate and small business alike. ObamaCare offers even more incentives for Corporate America to offshore operations, and it provides powerful incentives to millions of marginal small businesses to shut down or shed all employees. I am not alone in simply not wanting to waste the time, money and energy required to understand the new law and its various impacts on my business. We will cling to our already insanely expensive private healthcare insurance, which by the way has been grandfathered in: new self-employed entrepreneurs won't be able to buy the absurdly costly policy we have--they will be offered a range of even worse deals, with higher costs and less coverage. The neutron bomb has gone off, unseen by politicos and the Elites who wrote the bill. It is already decimating fulltime employment, and it will soon add momentum to the free-fall erosion of small business growth and employment. The strip malls and office parks will still be standing; there just won't be many employees in them. Thank you, Robert Z. ($100), for yet another outrageously generous contribution to this site -- I am greatly honored by your steadfast support and readership. Thank you, Tim L. (silver coin), for your stupendously generous contribution to this site --I am greatly honored by your steadfast support and readership.